6 Should I Worry About Drag? NB: Once you’ve read this post, you may want to read Part 2 about USB chargers and Part 3 about hub dynamo lights. We tend to carry quite a few gadgets whilst bicycle touring. We often encounter long stretches of road with little or no opportunity to recharge batteries, especially whilst camping in remote areas. Bicycle touring with a hub dynamo allows us to utilise the power output from a long day of riding to recharge our gadgets. I also use it to power my front and rear lights if I happen to get stuck riding after dark. Aside from these more obvious benefits, my favourite charm of the hub dynamo is the sense of self-reliance in remote areas. This three part article covers my current hub dynamo system, including installation and performance / usage tips for bicycle touring. I have tailored my setup for off-road touring, but it would work well for road touring and maybe even 24hr Enduro (though this bike is a bit heavy!). If you’re in a hurry and want a quick ‘how to’, just check out the photos below. Mouseover the image maps below to view closeups of the different parts of the system (hub dynamo, USB charger and lights, respectively). Hub dynamos are available in a range of formats and prices. German made Schmidt SON has a long-standing reputation for its durability and efficiency. They also offer a five year warranty. However, $250+ is a lot to spend on a hub alone when you consider everything else you need to buy for the wheel, lights, charger, etc. Shimano’s DN-3N80 hub dynamo is basically as you would expect from Shimano: a bit cheaper, a bit heavier and reportedly quite reliable, but they don’t look nearly as slick as a SON! Finally, the new kid on the block in hub dynamo technology is Shutter Precision (SP). 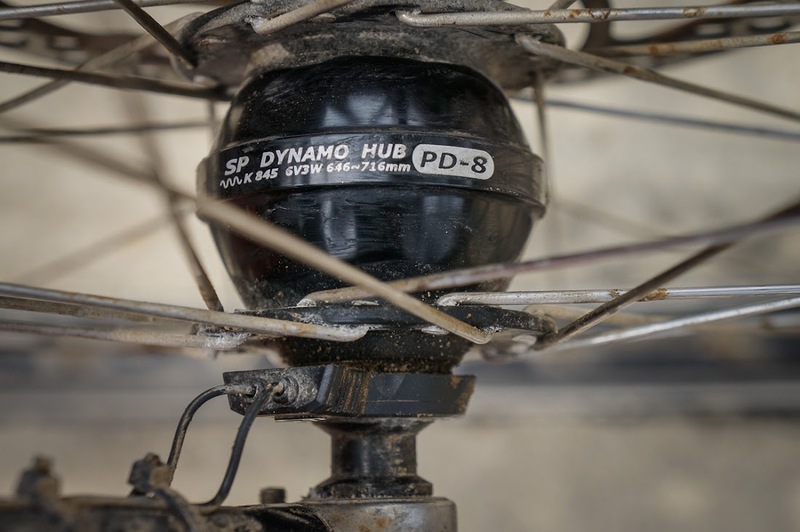 I first heard about SP hubs on the blog of pro MTBer Rob Dean. Check out his customised dynamo system, which has been coined the ‘Deanamo’. SP offer a range of hub dynamos at around half the cost of a SON; they are lightweight and their performance specs rival the SON. They do not yet have the tried and tested durability reputation of the SON, so I am to some extent a guinea pig in testing them for long distance touring. Still, given the great the price and specs, I am willing to give it chance! SP hub dynamos use a standard snap on connector. Just splice and clamp the cables once and then you can easily remove the front wheel whenever you like. A recent article posted by CTC presented results from some benchmark tests comparing the SON, Shimano, Supernova and SP hub dynamos. I later noticed that SP pointed out a few corrections in the CTC article which they posted on Facebook. I contacted Charles Tsai at Intelligent Design Cycles (SP’s largest aftermarket distributor) to gather some more technical data regarding the hub dynamo efficiency benchmarks. He was replied with some additional info in response to the CTC article. They should have compared the SON Delux to the SV-8. If they did, the SV-8 would be shown to be lighter and more efficient that the SON Delux. When evaluated on an even playing field, the data used in the CTC article indicates that SP hubs are more efficient under the official German StVZO regulation test conditions (i.e. hub dynamo running at 15 km/h with a 12 Ohm resistor load attached to simulate dynamo lamps). I haven’t conducted any tests of my own, but I think it’s certainly safe to say that the Shutter Precision 8 Series hubs are very competitive with the SON in terms of weight and efficiency, and they blow it out of the water on price point! The raw data from this article (on which the CTC article is based) indicates that the SP 8 Series is indeed more efficient than the SON Delux! There is also info on SP’s website about a forthcoming PD-8 X which claims a 6% increase in efficiency and supports both standard and 15mm axles! I also learnt that the Supernova Infinity S hub is actually a more expensive German re-branded hub dynamo using SP hub generator under the hood with some fancy weather seals to meet the strict requirements of German road safety laws for bicycles. The fact that Supernova are contracting SP’s technology and rebranding it suggests to me that they have quite a lot of faith in the quality! Obviously, a hub dynamo is not complete without the rest of the wheel. You will either need to pay a wheelbuilder to build the wheel or you can do it yourself. I decided to build my own wheels and I’ve been pleased with the outcome so far. If you want to try your hand at wheelbuilding, I would recommend the book Wheelbuilding by Roger Musson. This guy has built some wheels! I wrote about some of my experiences as a first time wheel builder here and also after a re-build here. Once you’ve built the wheel, you will need to connect it to your lights or charger using some cable and connectors. I’ve described this process in more detail in part 2 and part 3 this article. Once you have a complete hub dynamo wheel in your hands, your curiosity will inevitably make you want to spin it and feel the drag. The first time I did this, I was immediately concerned. I could feel a steppy, notchy-ness in the hub and I was pretty annoyed considering that I’d just laced up the whole wheel! Again I contacted Charles @ IDC and he referred me to this page on the Peter White Cycles site. I guess I am not the first person to ask this question! In summary, the notchy-ness is nothing to be worried about! Should I Worry About Drag? SP hubs are fairly new to market, so they haven’t yet had a chance to build a durability reputation like the SON. I have only now ridden 2,000km 4,500km 10,900km 15,000km on my PD-8 wheel, so I can’t yet comment on long term durability. I posted a question on SP’s Facebook Page asking about expected lifetime and service requirements. They quickly replied to say that the bearings are good for at least 10,000 km. 1st and 2nd place riders in the 2013 Tour Divide completed the race with SP dynamos. That’s 4500km and 60,000m vertical climb with plenty of dust, mud, rain and snow. Charles @ IDC also mentioned that there is an Australian rider who has already ridden over 10,000km in harsh conditions with no problems. Anyway, my hub has so far proven rock solid on the bumpy donkey trails and washed out roads of Mexico, river crossings of the Guatemala Highlands and even a bad crash which required a wheel rebuild. As long as I can avoid complete submersion in water, I hope the SP-8 will continue to remain problem free for years to come! 15 Responses to "Hub Dynamo Systems For Bicycle Touring: Part 1"
I picked up a Shutter Precision for thru axle only 6 months ago, after reading many very positive reviews, and it developed a bad bearing after only 2000 miles or so. It started developing more and more friction, and squeaking loudly. The problem is that I now need to build up another wheel which requires new spokes. It is also tough to source dynamo stuff, I had to ship mine back to Germany. Hoping from a refund from the Bike24, where I purchased it. I’m debating giving SP another shot, or going for a SON. I’m actually hoping to build up 2 dynamo wheels, one for my randoneurring bike, and a new one for my Surly LHT. Also considering Simano…. Wanted to share my experiences…. My first SP-hub developed a bad bearing after less than 10.000 km, but the company fixed it free of charge (cept for the postage to Taiwan). Thanks for you sharing your durability experience. It’s interesting that the SON died before the SP hub. Don’t Schmidt claim 50,000 km without a service? I guess it really depends on the conditions, water ingress, etc. I ride a lot of off road in wet and muddy conditions, but I try to avoid completely submerging my hub in water or mud. Well, the SON came used with a used Toxy CL, so I dunno what it’s prior history or age was. I then rode from Denmark to Kasakhstan and it gave up the ghost in China. Could have sent it to be repaired, but I estimated it would not be profitable. Plus I already had the SP by then. We are cycling around Europe and charge our devices off a 13 w levin solwing solar panel when there’s sun. It is great and charges all our devices the most powerful being iPad mini. We charge an external battery during the day and then charge off that later. Now that winter is coming we are looking for an alternative sufficient way of charging. We do roughly 70 km a day at about 20 km/h so as it sounds the hub Dynamo should work for us. The only problem is finding one. Does the hub charge faster at faster speeds or max out at 20 km. if we buy a good quality hub do we then have to buy an expensive converter to charge from usb?. I’ve not used any solar panel before, but I hope to try one out some day. Living in the UK, I don’t really get enough sun to rely on it. I use the SP PD-8 and PD-8X dynamo on two different bikes and I love it. If you are averaging above 20km/hr, you will definitely benefit from a hub dynamo. I find that the sweet spot for charging is between 15-30km, but the behaviour really depends on your USB charger. I am using the Revolution by Sinewave Solutions. This one is really great, and does not simply stop working at higher speeds. I previously used The Plug II, but I switched to the Sinewave because it’s more affordable, more weatherproof, easy to switch between my two bikes and it doesn’t stop working at higher speeds. I would suggest charging your external cache battery directly from the Sinewave charger and then you can recharge your devices in the evening. This is the best solution I have found so far. There are also some external batteries that allow you to recharge devices whilst the battery is recharging, but so far I have not found this to be necessary for my setup. Fantastic blog post. I was really excited when we got these SP hubs into the shop, and now I show them to every single customer who mentions wanting a dynamo for their bike. Now I can’t wait to check out the Sinewave Revolution. We just ordered one for a customer’s Brompton, and from everyone has to say about them, I’m sure it’s just a matter of time before I get one for my bike. They have a new version just out called the Reactor which plugs in just like The Plug, but they’re indicating it’s a bit easier to install and more waterproof than the Plug, so maybe check that out if you haven’t already. Great lot of info but I couldn’t find the answer to my problem. I have cycled India, some of South America, Australia and Africa without any dynamo hub as I hate anything that I don’t understand. I have just returned from 6,500 kms around some of Europe and decided to fit a dynamo hub. Here is my problem… The hub is an SP8 and the battery charger is an E Werk by Busch and Muller, the lights are also by the same company. I have wired it all up as per instructions and the lights work but my mobile says it is charging but the battery does not charge. Please try to help me or I will be forced to throw all modern stuff in the bin where it belongs and carry on using maps instead of GPS, singing instead of a music player and writing letters instead of Emails. Thank you. Gary. Some old bloke from England. Sorry to hear about your problems with the hub dynamo system! I think some phones and other devices can be fussy about their current threshold for recharging. The amount of current supplied by the hub to the eWerk system depends on your speed. At lower speeds, you may not be hitting the lower end of the current threshold required to charge your phone. I have the same problem with my Garmin GPS. I solved this by using a USB battery as an intermediate buffer. You can buy a pocket size USB rechargeable ‘cache battery’ on Amazon for about £20-30. Here’s a link to some popular http://thewirecutter.com/reviews/best-usb-battery-pack-travel/. You can then ‘trickle charge’ this battery while you are riding. It will be able to charge even at lower speeds, but obviously the faster you go, the faster it will charge! 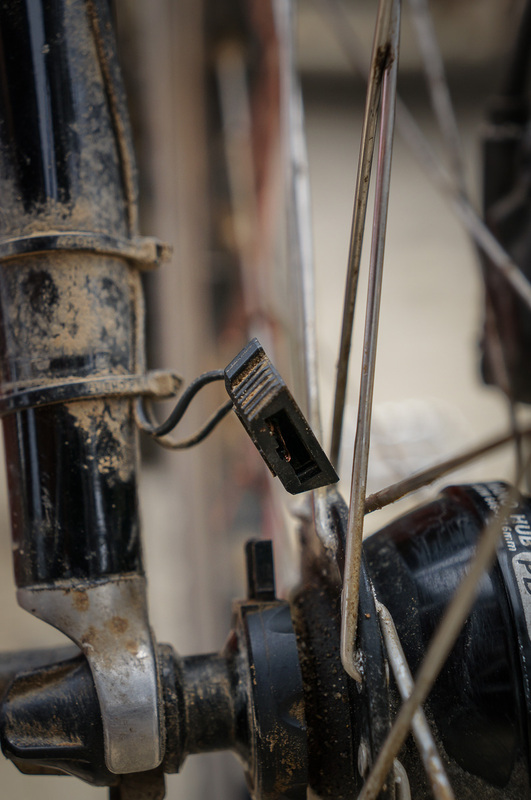 You can then recharge your devices later after you are finished riding for the day. I’ve been considering whether or not to get a dynamo hub and USB charger for my bike, so I was quite happy I came across these three articles! When you have been recharging stuff, aprt from the niggles with the Garmin, have you ever managed to fully charge something over a day? (for example your Kindle or a phone if you are carrying one?). I would just be interested to know if 6 or 8 hours on the bike can fully charge a device, or only get it halfway there. Hi Dave, yes I can fully charge some of my devices, but only on days without significant climbing. I’d estimate about 2-3 hours for a complete recharge if you can maintain a 20km average or 5+ hours for a 15 km/average.Recharging was easy on our route through Mexico, but is trickier in Guatemala and Honduras where we can spend several hours averaging 10km/hr! The USB recharging seems most efficient above 20km, but it does continue to trickle charge down to 14km/hr or so.